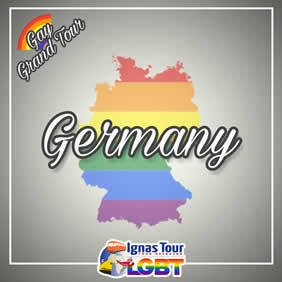 With a strong and diverse gay culture, Germany has some of the world’s best gay venues, gay Pride parties and festivals. A rich history and colorful traditions mix with a contemporary culture and truly progressive thinking, to make Germany one of the most dynamic and exciting countries to visit in the world. We are sure that you will appreciate the openness and generosity of spirit that exists in Germany — a country that is welcoming for all, and also has something for everyone to enjoy too. Explore this special country with us! A liberal metropolis where LGBT people are embraced as a natural part of society, Gay Munich is one of the hottest travel destinations right now! You can find just about anything here if you know where to look: beer halls, fine art, street cafes, historic architecture and even an oft-overlooked but very much alive gay village in Munich. Rainbow Tips: Live the vibrant gay atmosphere in one of the many pubs like Soul-City or New York. • Buffet Breakfast and enjoy your gay walking tour of Munich with your Gay/Lesbian Tour Guide. • Continue to the imposing Frauenkirche and Englischer Garten (English Garden). • Dinner on your own. Overnight in Munich. 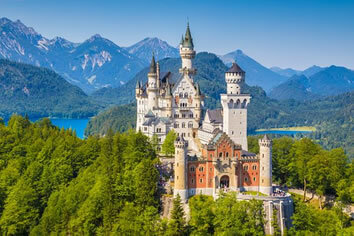 • Buffet Breakfast and departure to the worlwide famous Neuschwanstein Castle. Private transfer by Car or Minibus to the Castle. 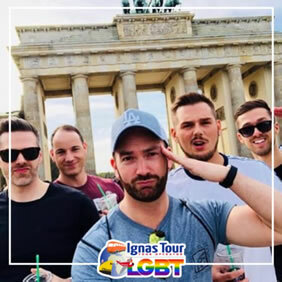 • Once arrived, enjoy a special tour with LGBT Friendly shared Tour Guide of Germany's fairy-tale castle, Schloss Neuschwanstein, in Schwangau (entrance fee included). Though the 19th-century castle's fantastic silhouette has made it famous, this creation is more opera set than piece of history, altough the interior was never completed. A tour reveals why the king of Bavaria who built it earned the nickname "Mad" King Ludwig. Tours last about half an hour. • Back to Munich city center with private transfer. • Overnight at your hotel in Munich. • Buffet Breakfast and departure by train to Freiburg, one of Germany’s most beautiful historic towns. • Late morning arrival and lunch on your own. • Explore on your own the city, which was damaged during WWII and rebuilt to preserve its delightful medieval character. Residents love to boast that Freiburg is the country’s sunniest city. Its cathedral is a masterpiece of Gothic architecture, built over three centuries. • Overnight at your hotel in Freiburg. • Buffet Breakfast and departure by train to Heidelberg. • Enjoy a special walking tour of the city together with a LGBT Friendly Tour Guide. Stroll along one of the longest pedestrian zones in Germany directly through the picturesque old town and admire the magnificent Baroque buildings. • See the beautiful Old Bridge and the impressive Church of the Holy Spirit, which once housed a collection of valuable documents. Walk through the former Hortus Palatinus (Garden Palatinate) to Heidelberg Castle ruins. • After lunch on your own, take your train to reach Frankfurt. • Once arrived, accommodation and free time to stroll around Frankfurt. • Dinner on your own. Overnight at your hotel in Frankfurt. 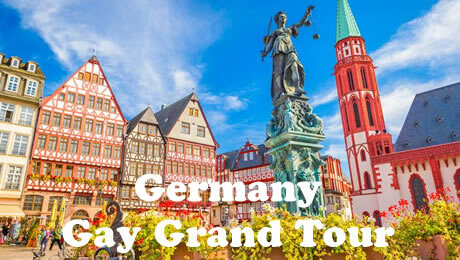 • Buffet Breakfast and discover with your LGBT Tour Guide the economic and international capital of Germany, the largest financial center on the continent, the historical city of coronations, the city of Goethe and much more. • Walk through the Römerberg, the ancient Old Town, admire the Dome, the Iron Bridge, Old Opera and Frankfurt Stock Exchange. Lunch on your own to taste local specialities. • Afterwards private transfer by car or minibus from your hotel to Frankfurt train station and departure to Cologne. • Private transfer by car or minibus to your hotel and accommodation. • Then enjoy enother special LGBT Tour of the city. Explore with a short walking tour this amazing town and its UNESCO World Heritage Cathedral, built between 1248 and 1880, a masterwork of medieval Gothic architecture. • Continue with the Old Town, with colourful houses that take you back to a time long gone. Continue to the Rhine Promenade and soak up the atmosphere of the historic breweries. Rising high above the narrow traditional houses is Great St Martin Church, one of the twelve remaining great Romanesque churches in the city. Meet Tünnes und Schäl, two figures that represent the original Kölsch inhabitants, and marvel at the historic town hall and tower. • Dinner on your own. Overnight at your hotel in Cologne. • Buffet Breakfast, private transfer by car or minibus from your hotel to Cologne train station and departure by train to Berlin. • Free time to discover the city of Berlin by night. • Dinner in your own. Overnight at your hotel in Berlin. 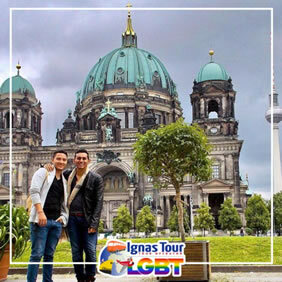 • Buffet Breakfast and start your Berlin tour with our Gay/Lesbian Guide with a view of the main highlights. • Observe the Brandenburg Gate, one of the most famous monument of Berlin, marking the beginning of the road from Berlin to the city of Brandenburg an der Havel and a symbol of unity and Peace after the destruction of the Berlin Wall in 1990. Continue to the memorial of the Jews murdered in Europe. • Then take a look to the Reichstag building, the German parliament. Walk along historic avenues such as Unter den Linden and admire Berlin’s Cathedral, passing by the Museum Island and reaching the Television Tower and Alexanderplatz. 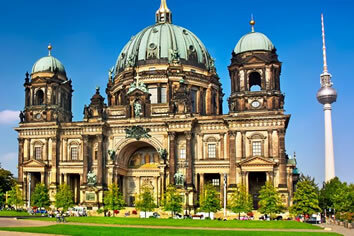 • Finally you will enjoy the special view of Berlin from above by climbing the TV tower. With 368 meters the TV Tower is the highest open building in Europe and one of the most popular tourist attractions in Berlin. Over 1 million people visit the TV Tower at Alexanderplatz every year. • In the afternoon explore with our Gay/Lesbian Guide Berlin’s gay neighborhood, Schöneberg, home of Marlene Dietrich and chronicled by Christopher Isherwood and Otto Dix. Visit the Eldorado, one of Berlin’s oldest gay and transvestite bars. • Visit a memorial to the homosexuals persecuted by the Nazis and find out how openly queer and transgendered individuals found assistance. • Then continue with public transportation to the vibrant neighbourhood of Kreuzberg to get a feel for what life is like today for queer individuals in Berlin. Find out how queer figures from the Prussian King Frederick the Great to openly gay mayor Klaus Wowereit have shaped the history of Berlin, a city which still believes a “kiss-in” to be the best form of protest, and finish the tour near to the Gay Museum. • After the tour enjoy a delicious Beer tasting (2 small German Beers) together with a typical Brezel salty bread. • Buffet Breakfast and departure by train to Potsdam where you will have free time to admire the opulent palaces and manicured gardens of Schloss Sanssouci (Castle), a palace constructed to resemble Versailles, which was used as a summer getaway for Frederick the Great and is a must-see (entrance fee included). • Back to Berlin and free time. • Breakfast in the hotel and transfer to the Berlin airport. Offering a gay-only paid sauna, a 24-hour front desk, and a rooftop terrace with city views, gay friendly Hotel Deutsche Eiche is centrally located in Munich. Free Wi-Fi access is available. A hearty breakfast buffet is provided every morning, and the restaurant serves classic German and Bavarian specialties in the evenings. A supermarket is located 100 m from the property. Hotel Deutsche Eiche is 1.2 mi from Oktoberfest - Theresienwiese, 0.8 mi from Central Station Munich and 500 m from Marienplatz Square and Town Hall. Located on the edge of the pedestrian area, this family-run hotel provides the ideal base for exploring the historical highlights of Freiburg. WiFi is free for guests. City Hotel Freiburg’s brightly decorated nonsmoking rooms include a TV, work desk, and telephone. A hairdryer is provided in the private bathroom. Located directly beside Frankfurt's exhibition grounds, this small 3-star superior hotel offers air-conditioned rooms and excellent transport links. The main railway station is a direct tram ride away. Individually furnished rooms with mini-bar and cable TV await you at the NH Frankfurt Villa. Free Wi-Fi is available in the entire hotel. Guests staying at the NH Frankfurt Villa enjoy reduced rates at the neighboring fitness club. Enjoy a generous breakfast buffet in the bright breakfast room each morning. Guests can sit on the attractive terrace during warm weather. The hotel is ideal for visitors to the trade fair center, and is also a short walk from the university and the Palmengarten park. The sights of the city center can be reached in a few minutes by tram. Soundproofed rooms, free Wi-Fi and a well-stocked bar are features of this hotel in Cologne. 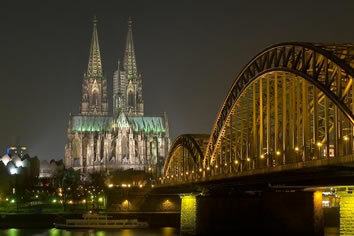 It is located just 1.6 km from Cologne Cathedral, one of the city’s main attractions. Cologne Messe Exhibition Centre is 4 km from the hotel. Severinstrasse U-Bahn Metro Station and Poststrasse U-Bahn Metro Station are both located within 500 m of the hotel, and offer connections throughout the city. Motel One Köln-Waidmarkt offers rooms equipped with a flat-screen TV, work desk and a private bathroom with hairdryer. Guests can choose to order a breakfast at the Motel One Köln-Waidmarkt. A variety of drinks can be enjoyed at the hotel’s bar. Tom’s Gay Hotel Berlin offers artistically decorated rooms which include a DVD player and private bathroom with shower. Free fruit and mineral water is available in every room.